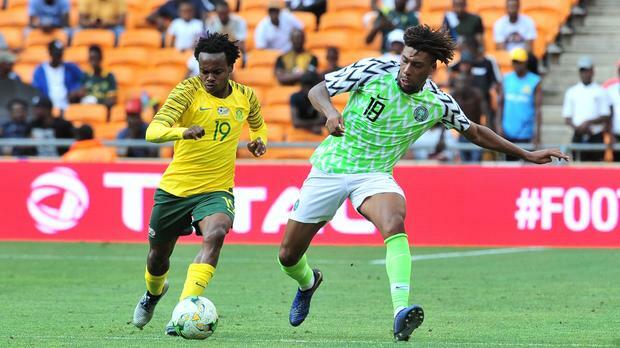 Asked which Bafana Bafana players stood out for him in Saturday’s 2019 Africa Cup of Nations qualifier that ended in a 1-1 draw, Nigeria coach Gernot Rohr singled out Percy Tau. That obviously had a lot to do with the striker twisting and turning three Super Eagles defenders to set up Lebo Mothiba for South Africa’s equalizer in the first half. But Tau also had plenty more moments of brilliance and was voted Man of the Match. “Congratulations to this player Percy Tau. I hope to see him at a big team in Europe – in England or the Championship. “He is a really good player, a wonderful player,” said Rohr, who also took a few moments to convey the same message to Tau shortly after his post-match press conference.